I was so happy to be able to do the Ellison Pas de Deux intensive! The following two weeks (after 5 weeks at American Ballet Theatre SI) I trained at Manhattan Movement and Arts Center. Technique class started at 12pm on Monday and we were combined with boys. This was the same everyday. Mr Ellison usually would teach our class, but some days we would have a guest teacher. In Mr. Ellison’s class you would have to remember each combination. Usually he would add on to them or add a few more throughout the week. Technique class was almost 3 hours on Monday. We had a short pointe warm up and then went straight into learning Diana and Acteon! I was partnered with my friend, Harrison, but we would all sort of practice with each other. I absolutely love Diana even thought it’s such a hard pas de deux. We learned about half the pas. We had a short lunch break and then continued working and cleaning the pas. Before class on Tuesday we would all go over the combinations and help each other. After technique class we finished learning the pas and also started working on the variations. My shoes were starting to soften a bit and we kept practicing the middle section, which is the turning section (it’s so hard) my right foot was bothering me I think from over-use, since that was the supporting foot of my good turning side. After class finished I went home and I could already feel my ankle becoming stiff on top. It was sort of similar to what I had during ABT. This time it was on my right foot and in a different location! (Ugh) I iced my feet and rubbed some arnica on them. I woke up the next morning and it was sill stiff and hurt a bit to walk. For class we had Maina Gielgud. Ms. Gielgud is a Russian trained International Répétiteur that partnered with Rudolph Nureyev! She then directed the Australian Ballet (1983-1997) and the Royal Danish Ballet. Read her full bio HERE . I told her about my foot and took it easy. I didn’t jump. Ugh I HATE being injured. It is so frustrating! As an observer of her class I noticed she focused a lot on port de bras and her style was a bit faster paced. The combinations moved quickly. She was a really nice person and a great teacher. I wish my body had been cooperating with me. I also told Mr. Ellison and marked the legs in the back. On Thursday my foot felt a lot better but still iffy. Our day was shortened because we had an in studio photo shoot with Rachel Nevel from 4-6. She is an incredible photographer. Check out her facebook page at www.facebook.com/RachelNevillePhotography. She also gives great advice for auditions and you can hire her for private photo sessions. We took quite a few group and pas de deux shots. On Friday I woke up very sore and it lasted for many days. I was mainly sore in my back. My foot felt way better!! This time we ran Diana and Acteon all the way through! Including coda and variations! This pas requires a lot of stamina, especially going from the variation into the coda. Ellison Ballet student Juliette Bosco. Copyright Rachel Neville Photography. On Saturday I just basically chilled inside all day and then some friends came over later in the afternoon. On Sunday I decided to go to class. Melissa and I were sort of disoriented that morning and were running slightly late so we took the bus instead of walking, which is what we usually do. We still got there early but not as early as we liked. Class was pretty rough for me. One, it was crowded, and 2, my Achilles was bothering me. One thing after another :/ I didn’t really do much of center. 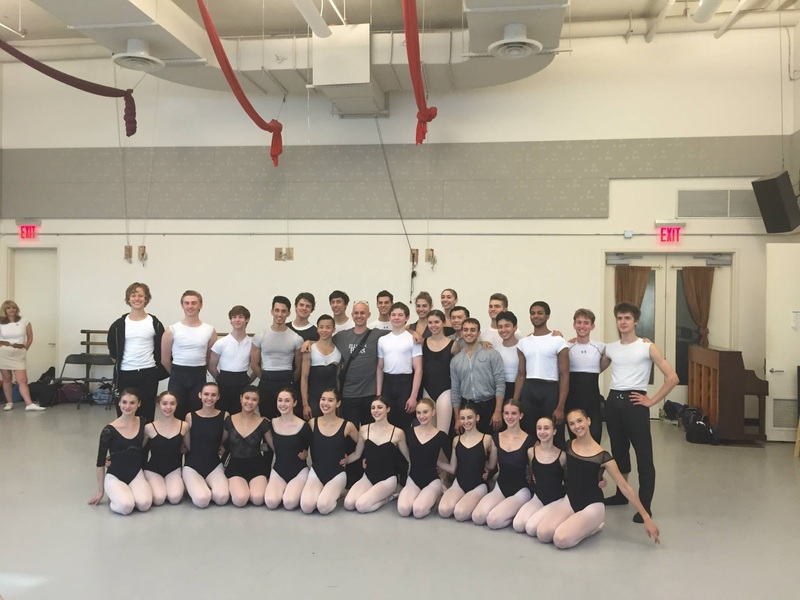 Also, Misty Copeland took his class. After class I hung out with some of my friends from the dorms. With my friend and classmate, Gillian Fitz. On Monday I headed to class. I like to get there around 11:15 or so. We found out we were going to learn Black Swan! For class we had Ms. Rakova. I liked her class a lot, but my foot was still bothering me. After class we started working on the pas. The version we learned is pretty different from the one I learned. This pas is so long so we didn’t get too far into the adagio part. On Tuesday we actually started learning the variation. We did the variation I didn’t do for my student show in June. I actually really, really like this one. We finished learning the whole variation in one rehearsal. Later in the day we continued learning the pas. On Wednesday we had technique class and a short pointe warm up and started with the variation again and then working on the pas later in the day. While we worked on our variations the boys had lunch and then when they worked on their variation we had lunch. I believe we started learning the coda. This coda is also killer because you start with 32 fouettés and then have a short breath and then dance the rest of the coda. I love it though! Thursday was pretty similar to Wednesday. Except we then ran the whole pas through. Boy was that hard. On Friday it was parent observation day. This is the first summer my mom wasn’t there but she did come for the end of ABT. For class we went non stop from warm up facing the bar through rond de jambes. The rest of the barre was also pretty fast paced. After class we had a short 10 minute break and then warmed up in our pointe shoes. We then started going into groups of 2 for showing the pas. We would alternate between Diana and the Swan Lake. After running a decent amount of groups we had a 45 min break. Honestly the pas were pretty rough. My Achilles was still slightly bothering me and I was physically drained. I think it was about time for a break! I have been home now for almost 2 weeks and my body really needed the rest. I am really stiff and tight though. Okay, time for my big announcement… I auditioned for the Ellison year round Professional Training Program and was selected. I have been wanting to do it since I was 13 years old! I know the training is just what I need and I am BEYOND excited for this opportunity. It’s going to be challenging to make it work financially but Mr. Ellison awarded me a 25% scholarship based on talent and potential. Thank you Mr. Ellison!! It is a huge honor to be accepted and extra rewarding, on so many levels, to receive a partial scholarship. This is what I have been working for. I am doing a fundraiser and you can read all about it and more about the program and my history at www.robbbiedowney.com. Thank you for following my journey this far and this next year is going to be so important for me. Every winter I watch the winter show case come and go and wish I could be in it! Every spring I watch the spring show case come and go and wish I could be in it! Every year I watch the YAGP group piece and I wish that I could be in it! Dorm fees are due now and Tuition is due 9/4! Thank you!